The Duodenal Switch (DS) procedure, also known as biliopancreatic diversion with duodenal switch (BPD-DS) or gastric reduction duodenal switch (GRDS), is a weight loss surgery procedure that is composed of a restrictive and a malabsorptive aspect. The restrictive portion of the surgery involves removing approximately 70% of the stomach along the greater curvature. The malabsorptive portion of the surgery reroutes a lengthy portion of the small intestine, creating two separate pathways and one common channel. 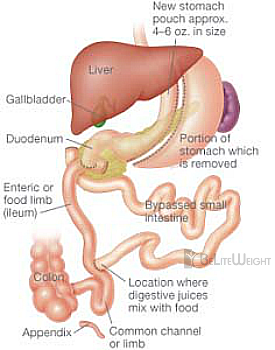 The shorter of the two pathways, the digestive loop, takes food from the stomach to the common channel. The much longer pathway, the biliopancreatic loop, carries bile from the liver to the common channel. The common channel is the portion of small intestine, usually 75-150 centimeters long, in which the contents of the digestive path mix with the bile from the biliopancreatic loop before emptying into the large intestine. The objective of this arrangement is to reduce the amount of time the body has to capture calories from food in the small intestine and to selectively limit the absorption of fat. As a result, following surgery, these patients only absorb approximately 20% of the fat they intake.